This young literary magazine features female-focused fiction, poetry, creative non-fiction and art. 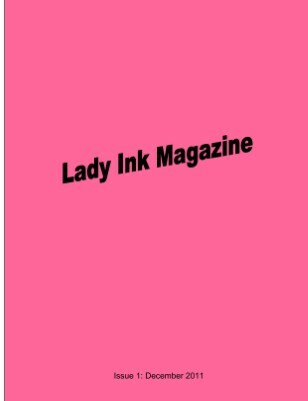 Intended to provide a uniquely favorable forum for publication, Lady Ink's aim is to promote female representation in the arts. Consequently, we welcome unsolicited submissions from amateur, veteran, and professional artists. Please read a little "About Us" and get to know your "Editors". When you're ready to show us your work, access the Submissions section of the website and we will provide a swift response. Thank you again for visiting and (hopefully) contributing to the Lady Ink project. Check out our first issue and don't forget to like us on Facebook! Submissions are open! (March 1 - April 15) Hi ladies! We have officially opened submissions for our summer issue. From March 1 to April 15, we will be accepting short stories, poetry, drama, and essays from lady-conscious writers like you!Please review the submission guidelines, as they have changed since last issue.Write on!